‘Voices’ captures the expertise and passion of the state’s premier naturalists and ecologists, many of whom have spent their entire careers protecting what they are now seeing destroyed. ‘Voices’ is a collection of written testimonials and informative articles focused on the critical importance and paramount need to protect and value Vermont’s mountain and ridgeline habitat, wilderness, and biodiversity. ‘Voices’ is presented and published with the intention of promoting the environmental, cultural, and economic values of our mountains. 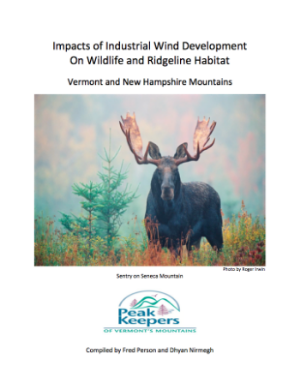 The first 'Voices' is "Impacts of Industrial Wind Development on Wildlife and Ridgeline Habitat". Copyright 2014 Peak Keepers. Site photos courtesy and copyright Sue Morse.